Super Smash Brothers Nintendo 64 Game cartridge Cleaned Tested and Guaranteed to Work! Super Smash Bros pits Nintendo's biggest stars against each other in an all-out slugfest. Delivering fast-paced fighting action which is easy to learn and tough to master, this game features new moves, never-before seen battle arenas, and a fresh arsenal of special items. They've raced cars, they've thrown a party, and now Nintendo's cast of characters is taking its competitive spirit someplace it's never been before: the ring! All of your favorite Nintendo characters have come together to answer the question: who is king of the Nintendo hill? The format can aptly be described as Super Mario Kart meets Mortal Kombat, which makes for an odd, yet addictive game. 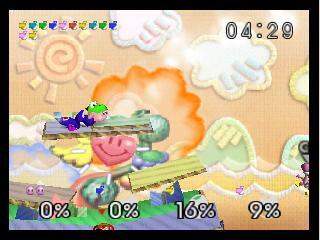 The object is to throw, punch, smash, or blast your opponents off the edge of the beautifully rendered, themed arenas. Numerous power-ups, weapons, and surprises help or hinder the melee. Your eventual goal is to fight your way through to a bizarre final boss character. Victory in this battle rewards you with another character to play, such as the scene-stealing Pokémon, Jigglypuff. Bought this as one of the Christmas gifts for my boyfriend, and he loves it! He said if works great. Him and his brothers have been playing it since I got it for him. Great condition works great my son is very happy. Shipping took 3 weeks. Been looking for this game forever, and this website has the best price i have seen! lots of great memories while playing this game, and works great. A must have! Amazing game, never gets old. this Game is a CLASSIC. worth every penny! the Game that started a revolution! Game arrived, quickly. My son did not open until Christmas. Game is perfect! Clean, works great! Highly, recommend. 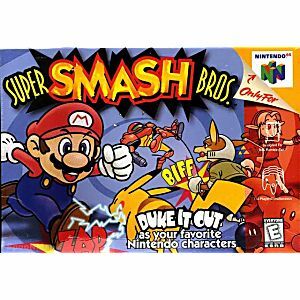 I'm not a 90's kid, but i do think this game is a really good classic for the N64, i got my copy from Ebay.com but however it is a classic late 90's game. that hasn't been said before about this game. The is the N64 the best console system hands-down. When you finally decide to start your own retro collection, this is an essential. 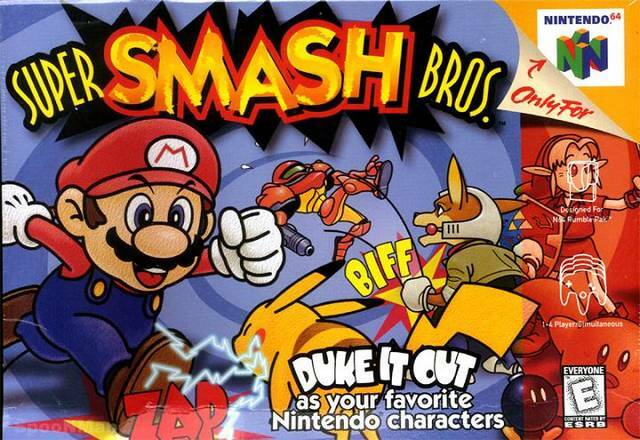 As far as gameplay goes, what isn't amazing about old Nintendo characters beating the snot out of each other. Fairly-priced here at Lukie Games. 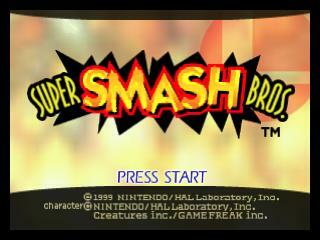 Hi i'm Patrick Moffatt and i am reviewing Super Smash Bros for the Nintendo 64 and i am so excited to play Super Smash Bros and i can play as 2 characters Ones with Mario and Ones with Yoshi and this game i played on my Red Nintendo 64 and i can played on a Classic Mode with Mario and i was very good at this game for long it has 4 Players you can Play as Yoshi Donkey Kong and Kirby in this game and i am reviewing Super Smash Bros for the Nintendo 64 Thank you. This is one of the greatest games of all time. Definitely my favorite for the 64. Lukie Games did a great job shipping the game, and they even verified it was actually me buying it.